The opening pitch being thrown during the July 12th game against the Colorado Rockies at Dodger Stadium. Photo by Jon SooHoo/©Los Angeles Dodgers,LLC 2013. In case you didn’t catch it, the Museum’s very own volunteer Hitoshi Sameshima threw the opening pitch for the Dodgers vs. Colorado Rockies home game on July 12th! 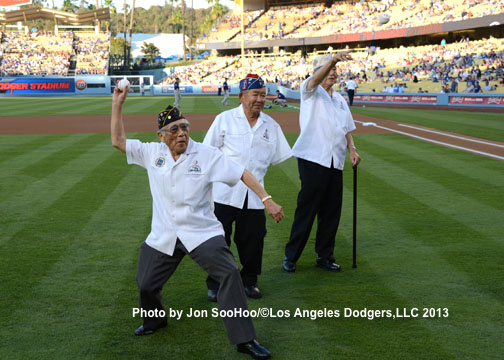 He threw a great pitch alongside two other World War II veterans, James Ogawa and Don Seki during “Japanese American Community Night” at Dodger Stadium. Sameshima is a familiar face at the Museum as a devoted docent, even giving a tour the day of the game. He was a student at the University of Southern California when the war broke out, and was eventually drafted into the Army while his family was interned at Gila River in Arizona. He served in the Military Intelligence Service as an interrogator and interpreter from 1944 to 1946.